Since the kidnap of Mazi Nnamdi Kanu by the Nigerian gestapo organisation, the DSS on the order of dictator Muhammadu Buhari in October 2015, the Indigenous People of Biafra have continued to demand for only thing, which is the "unconditional release" of her leader and not the type granted him by Binta Nyako on the 25th of April, 2017. 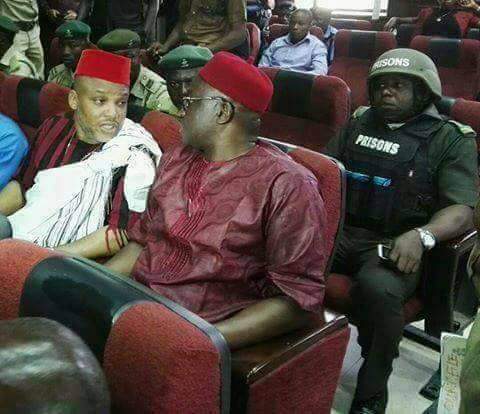 Nnamdi Kanu is a political prisoner who has committed no crime or exhibited any action that is untoward; yet Muhammadu Buhari and his Hausa-Fulani cabals have continued to play hide-and –seek using the Nigerian judiciary as its puppet in holding Kanu to ransom. It is on record that Justice Ademola Adeniyi on December 17, 2015 ordered the unconditional release of Mazi Nnamdi Kanu in Abuja high court, but that order has not been obeyed by Buhari and his government till date, yet Binta Nyako is giving another order of bail grant which is in sharp contrast to that of his learned colleague, Justice Ademola, and not in line with the constitution of the Federal Republic of Nigeria. Some barbaric conditions which people described as emanating from the pit of hell. I keep wondering why Buhari and his government cannot obey the first court order by justice Ademola Adeniyi and would expect Biafrans to accept the stringent conditions written in Aso Rock. The truth is that from every indication, the bail terms giving to Mazi Kanu is politically motivated and is not backed up by the Nigerian constitution. A condition that violates the right of a citizen is null and void as the court is expected to protect human rights and not be a violator of it. Nevertheless, we are not unaware that this is a well calculated strategy to further delay Kanu’s case and elongate our agitation for the restoration of Biafra. If Mazi Kanu’s bail was really based on health issues as she (Binta) said, why giving terms that are capable of killing him when he should be receiving treatment? why giving terms that would have been better off than not granting him bail at all? That Mazi Kanu must not grant interviews or press briefings while on bail is highly preposterous and unheard of. That he must also not be found in the company of people numbering more than ten (10) simply means he has been denied freedom of movement as there is no way he won't be accosted by thousands as a leader of his people. This can be best described as judicial extremism. It is a total violation of Mazi Kanu’s right to free speech and association as provided by section 39 and 40 of Nigerian constitution. By giving such stringent bail conditions, Binta Nyako has indirectly convicted Mazi Nnamdi Kanu without trial, because she has only succeeded in putting him in isolation outside Kuje prison. This is against section 36(5) of the Nigerian constitution, which provides that a man standing trial remains innocent until proven guilty by the court. Binta Nyako is nothing but a big disgrace to the Nigerian judiciary. We are the Indigenous People of Biafra and Nnamdi Kanu is our leader. We are not interested in the jungle bail and conditions attached to it. We demand the unconditional release of our leader Mazi Nnamdi Kanu and nothing less. We know that Muhammadu Buhari and his cabals are trying to test our resolve but they should know that the gentle step of a tiger does not mean cowardice.